It took me a while to fall as in love with wine as I have with fruit juice or soft drinks. I never really learned to appreciate the good efforts that go into the process of producing some of the best wines until I started taking a keen interest in them and once you get to know the process, falling in love with them becomes as easy as enjoying it over a good meal. The time wine makers take to produce the goods we find perfectly bottle in the store is simply phenomenal. From the use of different woods and the reasons why they prefer certain time periods, one could really learn to appreciate the work. 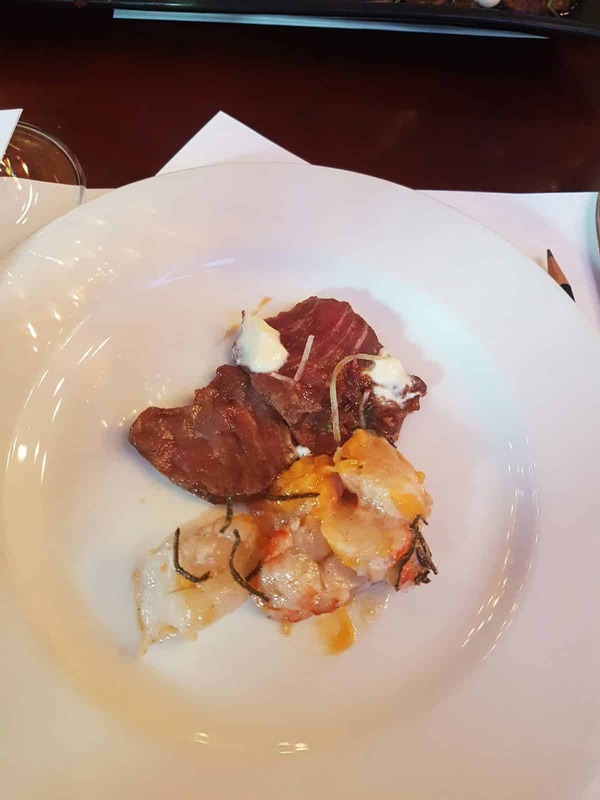 I had the opportunity to attend a pairing held at the The Mess restaurant and hosted by Uitkyk wine farm and it was a match made in heaven. Being a huge foodie always makes me skeptical of these events, but I was pleasantly surprised. We started out with the Mcc 2012 glass memoires served with canapes as our welcoming drink. I always admit to enjoying a glass of bubbly and although in the super market this might not have been my first choice, I am happy to say that I will include it in my list of wines to serve to guests. 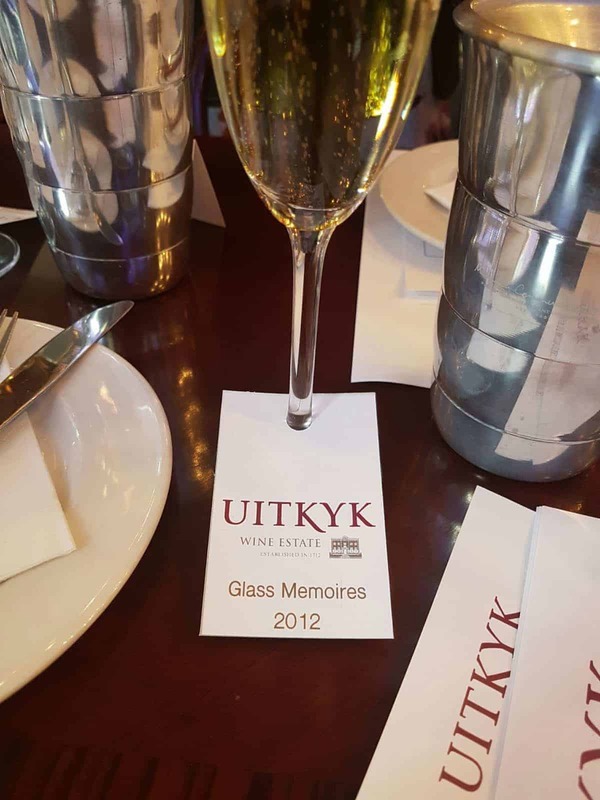 Although Uitkyk is not known as a bubbly producer, this has been on the lease for the past 4 years and seems to be doing very well for a sparkling wine so young into production. Made with no disage and only adding sugar to calm down the high acidity this slightly golden sparkling wine is thinner and slightly more dry and still very delicious when served at just the right temperature. Our first course was served along side the 2015 Chenin blanc. It arrived at the table chilled and with too little in the glass! I was not the only one looking for seconds of this lovely blend. It as a very strong raisin scent and it will be a very easy glass for a first time wine drinker. I thought it wasn’t too sweet or dry and serving it really chilled instead of using ice to chill in the glass was a great idea. For me personally I think that using ice ruins the taste of the wine and the efforts that the wine maker puts into making their wine. Lucky for us Uitkyk wine maker, Estelle Lourens was on hand to make sure that evey drop was enjoyed the way it was meant to. This is a great choice for seafood especially shell fish cooked with lots of flavour especially prawn or crayfish. Our second course was the Uitkyk 2015 Carlonet. This is by far my new favourite red wine. I loved that it was a full bodied red with low tannin and very smooth. You could taste the wine changing in the bowl with every drop and from one experiment to the next Uitkyk has come up with a brilliant red blend strong in its vintage, yet gentle in its taste. I can imagine using this in a meal as an ingredient, mostly a steak or beef and serving it in it’s latest harvest available. For a 2015 it is delicious even if it’s not very matured, but if left for a few years and then opened I can assure you you will find this wine to be a jewel in a bottle. The fact that they use French wood instead of American to produce this winner makes the wine less sweet and as Estelle said, there’s a place for everything, but the Carlonet remains French. I think that Uitkyk is a farm worth visiting for every Cape Townian wanting to learn more about the wine industry or just wanting to enjoy an afternoon out in the wine lands. Definitely worth a visit!Have a look at more Cape Town lifetsyle.